Update : if you want a version with a SWC for targeting iOS, please refers to this post. Hey ! I started to make my school game project this week. I advance quickly, it should be fine for the end of june ! For this third tutorial on the Citrus Engine, I explain better how you can use the Flash IDE as Level Editor, and I show two classes that I’ve created for my game. Here is what you will have. Adding platforms is always a difficult task, because of the rectangle’s angle. Try to don’t have corner ! A box2D platform with a rounded edge would be nice ! All my decorations are on several layers. Background, Bg Elements and Grass are big PNG 1409 * 637. I put them on the top left corner. If the length of the level is higher than 4000, you can use negative coordinates. So your level max length will be approximately 7500 px ! I created 4 MusicalSensor’s MovieClip, because I have 4 songs, I create one MovieClip by song. This is two new objects that I’ve created for my game. I will show their classes later. The loading TextField come from the stage (not the level stage). I add 4 sounds that I use later. You can download my zip. Avant tout merci pour ces tutos , je comprend pas comment tu as importé les fichiers as de citrus engine dans l’environnement flash professional. Merci Aymeric pour les tutos. Thanks for the tutorial! Very nice job! Really nice… been developing flash games for gaming sites a couple of years ago.. and still learned some more stuff here..
Hi Aymeric and thanks for the valuable posts, i intend to use CE to develop a platform game for iOS with Flex 4.5 and was wondering if there is a way to overcome the issue of not being able to load swfs at run time for iOS? Any advice will be appreciated- thanks. Thanks for the tip, for example, in the CE demo files, would this also work with embedding the whole level/layout.swf and then having ObjectMaker handle creation of the layout.swf objects or do i need to work with the layout objects as Symbols? Also, would you be interested in assisting us with the game development parts on consulting basis for some days? if so, please can you send me your email at info@ajmanagementconsulting.com so we can communicate outside the blog- cheers! I juste made a post about embed assets. I think there is always a lot of works to do from that. I’ve to handle SWC, it will be easier I think. You need to do performance test if you are targeting mobile devices. Box2D alchemy is really greedy. It depends of your game design obviously. which changes _animation to anim which can be set externally. This gets called at every update step. Is this a heavy way to go? seems that the animation only needs to be updated if a contact event had occurred? No, I don’t think that it is too heavy. You may optimized if you make the animation change into the class itself, not on the state. The Citrus Engine needs an enter frame function to play the MC animation fully. Ok got that. Just to clear my head though, here we are just waiting to switch from black to white on contact- maybe its even just a static image – but even if it isn’t, would the animation(eg black.swf) not just continue to play without further calls until an endContact would switch it back to black? Yes the function will always be called, but the animation will stop because it is a gotoAndStop in my swf! The Citrus Engine “manage” the animation loop or not. Even if the animate function is called, there isn’t a performance drop, it is not significative. I know, that this is a dumb question, but I have a few problems right now. Is it right, that this code (in the gamestate-class) should create a white instance of roseau? After a little break, I think I finally got the sollution. 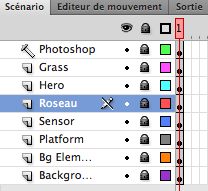 I think the reason is, that my roseau are loaded at runtime. I try to access the timeline, before the swf is completely loaded. But how can I check if its loaded? Is there a way to add an EventListener or something to a CitrusObject? SpriteArt has a ContentLoaded-Handler, but I dont want to modify this class.